I stop to consider what kind of Manchester she must inhabit for the opening of a new tram line to be the most exciting thing in her life. Then remember that I’ve made the trip especially to take the journey, so consider this is a score-draw. No section of the Metrolink ‘big bang’ expansions have yet opened on time, which one supposes is just another ape of big brother London Underground. This has opened up a shed load of criticism from just about anyone living with a Manchester postcode; even when lines are opened there’s always a failed tram somewhere, invariably at the MediaCity pokey-out-bit, causing back-ups in central Manchester that would cause the populace of most other cities to storm municipal halls seeking vengeance. In anycase, excitable Deansgate woman boarded her tram to Piccadilly, leaving me alone on Deansgate(-Castlefield) with a return ticket and nobody to share it with. The Oldham Mumps tram arrived a few minutes later, coming from what will eventually be the direct link through southern Manchester to the Airport. I was one of a number of passengers who stayed on at Victoria, though the crawl through the city centre (during which the tram runs at road level along side shops and shoppers) saw many people depart at Market Street or Shudehill. The greatest influx of passengers came at Manchester Victoria, and of these, I’d be generous to call the majority of them ‘enthusiasts’. Dozens of men – and they were all men – with various shades of grey hair stood or sat with cameras and notepads close to hand. Six Metrolink uniformed men – and they were all men – stood in a clump on the platform, the least proportionate crowd control I’ve seen outside gigs. 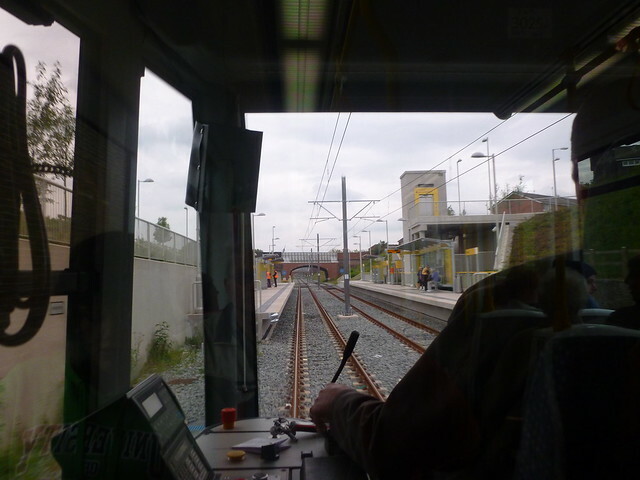 Unlike the London Underground, Manchester’s trams are essentially silent. No constant roll-call of messages and warnings, or the over repetitive destination speeches (“This is a something line to somewhere, the next stop is someplace, change here for other lines and two arbitrarily selected tourist attractions.”). Metrolink’s delicately accented woman waits until a station is arrived at, says “This is an Oldham Mumps service, the next stop is somewhere”, and then keeps silent. Bliss. Joy be praised. She even says “Mumps” with a clipped Lancastrian accent, which is a bonus. Whilst waiting for the first stop, I check Twitter for various related search terms. “Who the hell decided to call it Mumps?” asks someone. “As if a new line to Oldham is considered news!” sneered another. Tough crowd. “Freehold? !” said another tweet, stunned into just one word by one of the newest stops on the newest line. 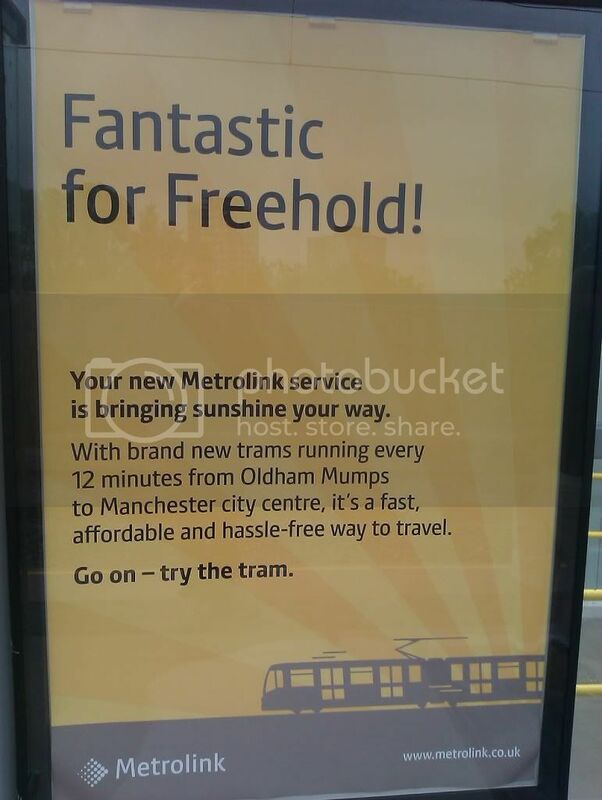 All Metrolink tram stops have been given cheery little posters from TfGM, saying things like “A Perk for Central Park!” and “Nice one Newton Heath”, “Fab for Failsworth!”. I wonder how long that could keep going. If there’s ever a station opening on a Queen Street, I’d pay the advertising department all the money I’ve got to see what they come up with. As each stop approaches, it soon becomes clear that only two kinds of people are waiting on the platforms; enthusiasts with cameras and twice their number in Metrolink officials/ticket inspectors. I can’t say for certain if anyone leaves our tram at any of the intermediate stations. Other than the Clipped Accent Announcer Woman, the only other sound is the beep-whirr-click of cameras. Central Park was opened in 2009, then left to gather rust and publicity posters for local music events, leaving the glass and chrome canopy roof resembling the entrance to an abandoned tourist attraction in a recession hit corner of Spain. It seems to be in the middle of a cross-fingers and hope regeneration park, which makes the poster’s slogan – “A Perk for Central Park!” – seem somewhat condescending. My personal highlight of the journey is the approach to South Chadderton, built like the very best bits of London’s DLR or a low-budget rollercoaster, dipping down from height to reach the station, which has been built in the ‘bowl’. I can imagine – and experienced – drivers having a lot of fun with that. Arrival at Oldham was not exactly ‘low key’. Whilst all local journos had by then gone home – first services arrived just after 6am – there was a large crowd of photographers and curious locals who seemed close to applauding everyone who alighted. My fellow passengers divided into three types – a number stayed on the platform ready to ride the same tram back to Manchester, others left by the southern entrance, and others still followed me into Oldham’s town centre. The route to Mumps is only temporary, as all maps are at pains to remind locals. A new line will cut into the town centre itself, leaving the current Mumps station as a briefly existing blob on the network. For a temporary station, it’s looking very much the part, not least because it’s been given all the corporate yellow gloss that TfGM can throw at it. The predecessor station was notoriously grim, though both suffer from being located on the wrong side of a dual carriageway. At the recommended watering hole of the Ashton Arms, the landlady was deep in conversation with locals and enthusiasts about the new line’s opening. “Two years late, more expensive, longer travelling times and no toilets!” she summarised before serving me. “But that’s progress, eh?” I offered. The journey back into Manchester is noticeably slower, with the driver, an assistant in a hi-viz jackets and two ticket inspectors (and/or revenue protection assistants or whatever we’re calling them this week) enjoying the view from inside the cab. Views of life outside the trams show a very mixed economic and social picture of this part of Greater Manchester. Freehold and South Chadderton give very resplendent shots of empty, decaying factoriesa, their chimneys the only element not crumbling around themselves, green-blocked windows staring out across terraces and far-flung suburbia. There may be amble opportunities for photographers to make mean and moody shots of northern England from the pristine white platforms of the Metrolink, but it’s not so good a selling point watching so much of England’s industrial past left to rot and ruin. As much as I enjoyed my….three….pints (and a packet of Scampi Fries, of course), Oldham is in need of whatever economic boost the trams provide. The walk into town is quite an eye-opener, with more For Sale signs than I could count attached to long since abandoned stores. The open market was a great sign, with people milling about occasionally stopping at a butcher’s or what seemed to be a bathroom fitting salesman, though even this is tucked away in the background with all the signs of it being left to fend for itself. All that said, at Failsworth a number of people boarded who looked positively normal (teenage girl with scowl, two teenage boys with hats at a jaunty angle) and Victoria, where I departed, was a success for people shopping over people taking photographs. It’s doubtlessly overdue, dripping with cynical doubts and occasionally just plain not reliable, but Metrolink is a success and this new line was an interesting day out experience. I will not, however, use the excuse of one decent pub for having daily excursions to Oldham. Awarding city status to Preston has had the long term effects similar to giving the OBE to a dinnerlady; welcome recognition with no tangible improvement. Preston is a great place, and I defend it whenever up against the usual insults (nobody gets within pen throwing distance of criticising the Bus Station when I’m in ear-shot, and don’t get me started on the Football Museum…). However, most Prestonians with an ounce of realism to them knows the market town outside their walls has not made anything like the significant strides towards fitting the presumed look or feel of a “city”. And furthermore, these people welcome that fact. I certainly do. Preston is not Manchester, nor should our councillors and unelected “vision board consultants” pretend otherwise. A new report suggests that Preston is “boring” before the neon strip kicks in at nine, and that the town…place…has not much to attract families. There is quite a lot I agree with. Preston has always had a great and vibrant nightlife. My memories of boozy college nights and similarly liquid weekends after work all go back to pubs and clubs around Preston. The Black Horse is one of the best pubs I’ve ever been to, and not just for the Double Hop. Pub Quiz anoraks must know why it is one of the only buildings of its kind, too…? One suggested improvement is a “late and live” style initiative to attract people into the city. I shudder at the management speak used, but agree with the sentiment. Preston used to have far more live music venues for people with only a couple of bank-notes in the backpocket; they have almost all closed or had a change of management. The Guild Hall should not be the only place in the city to see live theatre. The Frog and Bucket has been a surprise hit – I admit to suggesting it would close down without much notice within weeks – although its future is somewhat compromised by the mythical Tithebarn rejuvenation project. Preston has a lot going for it; from the Continental pub’s theatre and music, to 53º with is superstar roll call of live acts, the easily accessible green bits including (just, boundary fans!) Beacon Fell, the Millennium Canal Link, and apparently a Championship level football club…. There is an elephant in the room, of course. Improvements to one part of the town cannot be made without looking at the wider picture. Tithebarn – the multi-million pound fairy story cooked up by “development agencies” – would be a disaster for those on low and middle incomes living in the immediate surrounding areas for whom John Lewis and high-end restaurant eating comes pretty low on the list of priorities. Demolishing 1,100 car parking places in addition to the 80-gate bus station would do nothing to encourage families to visit. All these “improvements” remain high on the list of Preston Council’s vision for the future; all of them are completely blinkered, short-termist nonsense. Preston needs far more than shiny buildings if it truly wants to fit into the new city clothes. A transport system fit for the last century would be a start. Acknowledging that thousands of people would prefer money spent outside the city centre wouldn’t go amiss either. Preston is a great place to live and work and drink, but years of political short-termism has dragged progress to a complete standstill. Like Mavis Dinnerlady OBE with her daily routine, Preston seems satisfied and comfortable without any major cosmetic changes. I would much prefer to bring a new sense of renewal to Preston in stages, bit by bit, sector by sector. Mavis would not serve Masterchef dishes the day after meeting the Queen; Preston should not start swinging the demolition ball the day after this “boring” report.